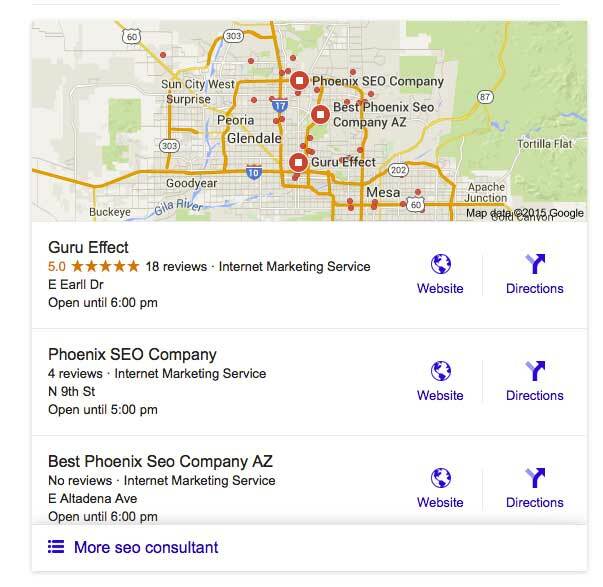 Did you search for the “best SEO company in Phoenix” to find this post? 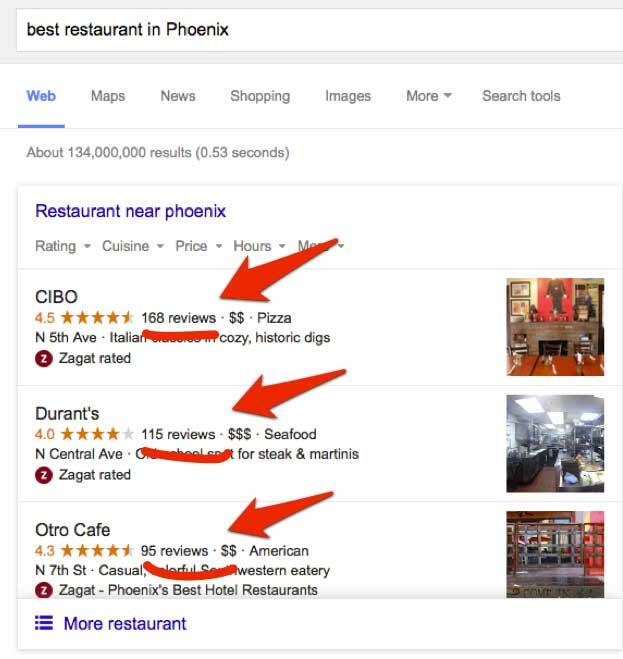 I originally wrote this post in 2013, but I am updating it because Google’s algorithm is getting better at understanding what the best means, when people search for it.. For example, if you search for the best Restaurant in Phoenix, Google responds by listing the restaurant with the most 5 star reviews. It is CIBO, by the way, with 168 reviews at 4.5 stars. That is followed by Durants, a classic steakhouse downtown, with 115 reviews, and finally, Otro Cafe with 95 reviews. Simple, right? If you want to be ranked #1 for being the best of anything, Google is going to ask you to back that up with genuine reviews. This presents a problem for many outstanding small businesses. Personally, I have a favorite and it doesn’t appear on the list. It’s difficult to get people to write reviews and sometimes, it’s impossible. For example, anyone in securities has to be very careful about reviews. The SEC has strict guidelines about testimonials. So what’s the best financial planner in Phoenix supposed to do if he or she genuinely does not want client reviews? (And I have a client just like that.) Another example is a bankruptcy or criminal attorney. It’s difficult to get someone to say a particular firm is the best, when the reviewer hired you for a criminal matter. 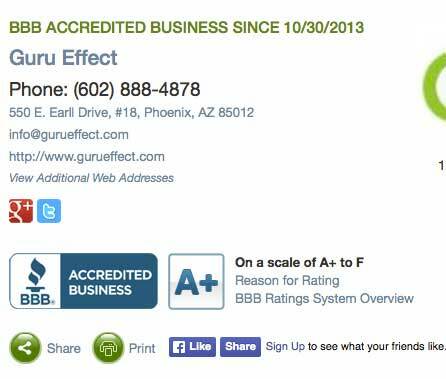 Guru Effect LLC started as a one-man operation (me) and now we have four employees. I have been doing SEO work in Phoenix for 14 years, and in that time, we have still only accumulated a small amount of reviews (18). So if our competition is reading this; I feel your pain. I mean, I don’t really care, but I feel your pain. However, for years, I believe that Google disliked superlatives. It never seemed to work very well. Because, in reality, whatever your business, why not just optimize for “best”? It’s too simple. I’m not saying it can’t be done. But Google was never super-easy to trick by simply declaring your company to be the best, using meta tags and keywords. But now, with the local algorithm heavily relying on reviews, Google does indeed understand what “the best” means. It’s no longer a matter of titling your page as such and waiting for the magic to happen. You need reviews. Preferably Google reviews, but Google takes Yelp, Zagat, and a host of other trusted review sites into consideration. We do not use Yelp, because it’s too easy for competitors to harm your SEO with bad reviews. And, if that happens to you- and you’re not an advertiser with them- let’s just say they aren’t very helpful with having fake reviews removed. We rely on the BBB and Google. Our strategy behind this is simple: If anyone ever was to give us a bad review, we would point them in the direction of the BBB and ask them to file a complaint. In reality though, we don’t have angry clients. That’s why we have an A+ rating with the BBB. Do I Want To Fight All The Other “Best SEO Companies” for this Silliness? Now when I write that it’s silly, what I actually mean is that it’s a losing proposition for all but one SEO company in Phoenix. If you are going to write a post proclaiming that you are the best, but you are in any position other than #1… The irony is just ridiculous. 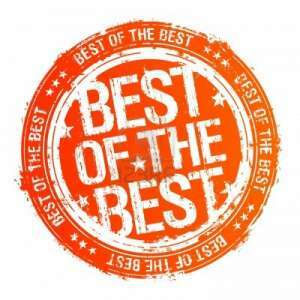 If you are the best SEO in Phoenix, you should write a post proclaiming it- I agree with you there. I just don’t know if it’s going to help, considering that the semantic SEO algorithm is getting better every day, but it’s worth a shot. Then again, maybe the Googlebot has a heart. Maybe the Googlebot will tear up a little bit at my honesty. At the idea that I am writing this post against all of my gut instincts. My big fear is that I’ll land on page one for the phrase (I won’t write it again) best SEO company in Phoenix (damn, I wrote it again) and I’ll land in position #5. Then I’ll probably need to take this down. All this typing wasted? So this is pretty simple. Obviously, you are looking for somebody in Phoenix, otherwise, I have no idea how you arrived on this page. Did Ariana Huffington link to me again? The way to find the best SEO company is not by searching for that very thing. As far as I know, there isn’t a Best SEO award handed out anywhere, ever. But, on the other hand, if you know of such a thing, drop me a line. When you search for phrases (a.k.a. long-tail keywords) like that, all you’ll find are pages- just like this one- where the SEO expert themselves simply declared themselves to be the best. The only way to find the best is to search Google and the best SEO company is the one that shows up for the thing that you want. They don’t necessarily have to be #1, but they should at least be on page one. Also, when searching for an SEO company, there is something else you need to consider. There are basically two types of SEO companies: The kind that serves everyone and the kind that specializes in a certain industry. They both have advantages and disadvantages. For example, if you hired a firm that specialized in law firm SEO and you are an attorney- that seems like a good thing, right? It’s good because an SEO firm that specializes in a particular field might very well be the best in that area. However, continuing to use “law” as my example- they are also doing the SEO for your competition. If you only do SEO for a certain type of client, then there will come a time that your company will be working with your client’s competition concurrently. We specialize in certain areas: Law, Real Estate, Local SEO – but our clients are varied and come from all over the United States. Are we the best? That’s up to you.